This is Day 26 of our 31 Days of Less & More challenge. To read all the posts in order, start with Day 1, then visit the Overview Page to see the entire series. I blame all the dressers. Those drawers are like clutter magnets! Of course the desk in the corner piled high with projects, paperwork, household files, and who knows what else isn’t really helping either. And then there’s the laundry that needs to be put away, and the basket of stuff I’m not quite sure what to do with, and the suitcase that still needs to be unpacked. It is so easy to neglect the our bedrooms, to simply close the door on the accumulation of this and that and the other thing and relegate that space as something we will get to “someday.” In the meantime it becomes a cluttered and stressful space, one we can’t wait to get away from, rather than the restful sanctuary it should be. When I consider that a third of my life will be spent in the bedroom it makes eliminating the chaos and transforming that space into a haven where we can recharge from the demands of the day seem a lot more important. Essential even. 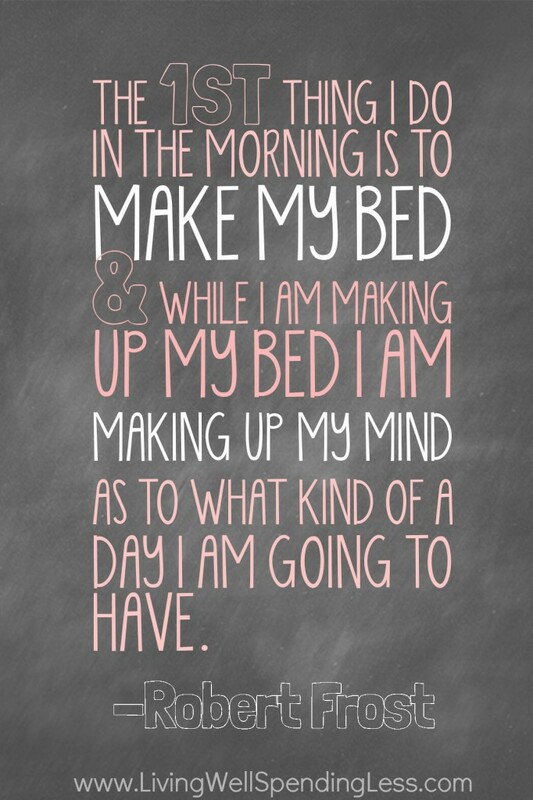 Make your bed every day. Developing this one single habit makes such a big difference in the overall feel of your room! A made bed just looks better. Straightened sheets and comforters with pillows in their proper place are far more esthetically pleasing than disheveled blankets and a pile of pillows on the floor. There is nothing I love more than crawling into a carefully-made bed. It is so comforting! Rather than needing to wrestle with tangled sheets or scoop up blankets from off the floor, I am instantly relaxed and ready for a night of rejuvenation. A made bed just feels better, the blankets stay on all night long, and I sleep much better.. Calm your closet. In this series we’ve already talked about calming our closet chaos, but an organized closet helps keep the rest of your bedroom free of clutter as well. Take the time to weed out the clothes and shoes and excess stuff that you are not wearing, either because it doesn’t fit or you don’t really like it. The less you have, the easier it is too keep clean! Get rid of what doesn’t belong. I don’t know how it works in your house but my kids have this terrible habit of dragging everything they own into my bedroom, then just leaving it there! I also have a tendency to dump all the things I’m not quite sure what to do with in a pile on the dresser (especially when we are about to have people over!) Take the time to remove all the things that don’t belong, whether it be toys or paperwork or piles of laundry. I have also found it really helpful to keep a large but pretty “collection” basket in the corner to catch all that stuff that gets left behind. Add ambiance. A few candles can go a long way. Ditto for some fresh sheets, a freshly swept or vacuumed floor, dust-free surfaces, and smudge-free windows and mirrors. Make it a priority to keep your bedroom a haven. Be sure to read Edie’s corresponding post, More Intimacy. Spend some time today turning your bedroom into the haven it should be. Make the bed, then clear the clutter from the dressers and put away the pile of laundry or things that don’t belong. Dust & windex any dirty surfaces, then light some scented candles to help create a relaxing mood. Next, make intimacy a priority. Do something to let your husband know how much he means to you. It could be as simple as a sweet text to let him know you are thinking of him today. It could also be a love note, (Crystal is great at making this a priority! ), a special meal, or a backrub after the kids have gone to bed. It might help to revisit your wedding pictures and remember the joy of young love. Kiss him like you mean it! Be sure to check out Crystal’s thoughts on Less Kitchen Confusion/More Pretty Pantries from yesterday’s post! Is your bedroom currently a forgotten dumping ground or a well-tended sanctuary? I’m going to have to go with dumping ground right now!